If you are in a hurry you can make this with a couple of cans of drained and rinsed borlotti beans and it will still be good. But home-cooked beans just have that unctuousness and depth of flavour that canned beans don’t. In summer, fresh borlotti beans would also be wonderful (use double the weight of fresh to dried beans, so 400g/14oz). 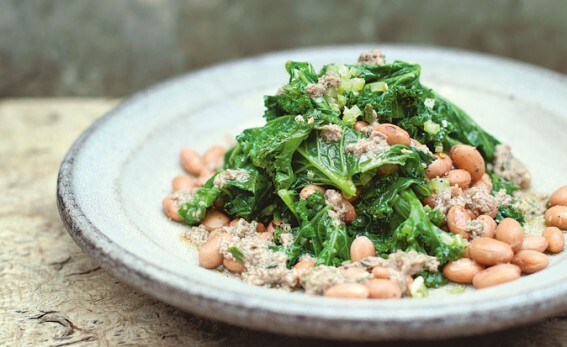 Just shell the fresh beans and cook in simmering water for 30–40 minutes, or until tender, and replace the kale with 500g (1lb 2oz) of spinach, adding the leaves to the dish at the end of cooking just long enough to wilt them. This is a very ‘meaty’ dish, despite there being no meat in it. It’s lovely with farro. If you are in a meat-eating mood it’s also great with roast lamb (and not bad with roast chicken). The anchovy sauce is definitely a recipe to keep. It’s excellent with meaty fish such as monkfish. Put the borlotti beans into a heavy-based pan with water to cover, the halved head of garlic, parsley stalks, chilli, carrot, bay, two of the celery sticks, each broken in half, and 4 tbsp of the the extra virgin oil. Bring to the boil, then reduce the heat to its lowest, cover and cook for an hour, or until the beans are tender but not falling apart. Drain the beans and remove the garlic, parsley stalks, carrot, bay and celery. Return the beans to the pan with 2 tbsp more of the extra virgin oil and the juice of ½ lemon, salt and pepper. To make the sauce, pound the rosemary in a mortar then add the anchovies and crush to a paste. Gradually add the lemon juice and then the extra virgin oil, a little at a time, grinding as you go. You aren’t making a mayonnaise, so don’t expect this to emulsify. You’ll be left with a lumpy sauce, but the pounding just melds all the elements together. Add pepper and set aside. Rip the kale leaves from their coarse ribs (discard the ribs) then plunge the leaves into a pan of boiling water. Cook for five minutes, then drain.Rip the kale leaves from their coarse ribs (discard the ribs) then plunge the leaves into a pan of boiling water. Cook for five minutes, then drain. Dice the remaining celery stick and heat the remaining 2 tbsp of extra virgin oil in a large pan (preferably a sauté pan). Cook the celery for one minute, or just until it is beginning to soften but hasn’t yet lost its bite. Add the sliced garlic and chilli flakes and cook for another minute, then add the beans and kale. Carefully heat these through without squashing them or overcooking. Check for seasoning, add some more lemon and serve with the sauce.